The very nature of tsunamis makes them almost impossible to prepare for, but that hasn’t stopped one man from developing a capsule designed to keep people safe in such circumstances. To help people stay safe during natural disasters, a Palo Alto, California-based designer named Chris Robinson created a unique pod he calls the Tsunamiball. 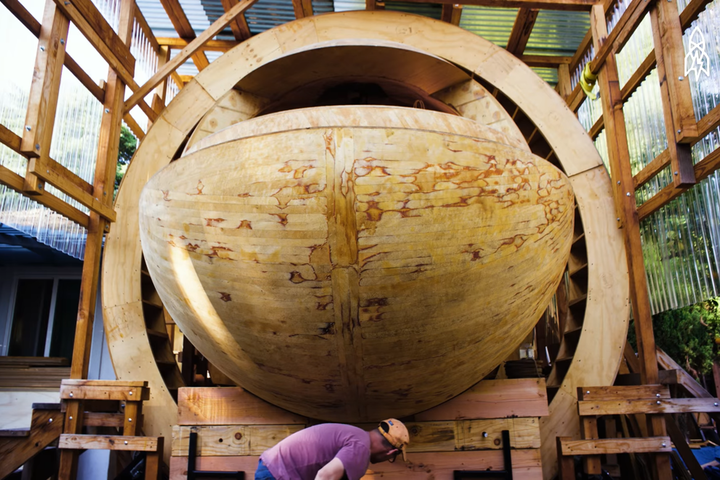 Designed to survive an inland tsunami, Robinson’s creation has people dubbing it a “modern day ark.” Robinson said the Tsunamiball concept was inspired by the disastrous tsunami that hit Japan in 2011, when he watched people struggling to find shelter and safety. At first, the Tsunamiball idea appeared more like a ping-ong ball than its current, elongated version. Robinson admits that while designing the pod over time, he eventually stretched it out to appear more like a capsule — a design that seems to function better than a spherical ball. Despite having never actually sailed a boat or physically built one, Robinson remains committed to bringing the Tsunamiball to life. Robinson hopes to outfit the Tsunamiball with electric motors, as well as solar panels and batteries along the capsule’s exterior. The finished capsule also features a navigational system that allows someone inside to steer the rig, though Robinson points out that it’s “not going to be a speedboat.” Despite its slow speed, it’s still maneuverable enough to make it easy to get to shore or travel to someone else who might require help. Though Robinson admits the project is “dumb” because of the amount of time, money, and effort it requires of him, he sees it as an adventure he feels compelled to complete. He hopes it may one day actually help someone in need. As of now, the project exists as a work in progress, though Robinson routinely publishes updates of his work to a dedicated Tsunamiball website.